JEFFERSON CITY, Mo. — A new chapter in Missouri’s history book has begun with the swearing in of Mike Parson as the 57th Governor of the Show-Me State. “Public service is a privilege and it is truly an honor to serve as Missouri’s 57th governor. My pledge to all Missourians is to work hard each and every day, to bring honor, integrity, and transparency to the governor’s office,” said Parson during his swearing-in ceremony. The 62-year-old Republican stepped up to take the place of scandal-plagued Eric Greitens, who announced his resignation from the position on Tuesday evening. “We have an opportunity being today to have a fresh start in state government,” state the third generation farmer. “I believe now is the time for Missouri to come together, to work together, and to help one another. The man stepping up to replace Greitens is vastly different on a multitude of fronts. Parson is from a rural background and has a decade of experience as a Missouri lawmaker — a time period in which he remained scandal free. An action that also set Parson apart from his predecessor was that he took questions from the media after his swearing-in ceremony. Born in 1955 in Wheatland, Missouri, Parson grew up on a farm and graduated from Wheatland High School in 1973. He joined the U.S. Army at 19-years-old where he served two tours — one in Germany and one in Hawaii — in the military police corps. He worked his way up into the criminal investigation division of the Army. From 1993 to 2005, Parson served as the elected Polk County Sheriff. At the same time, he ran a small farm in Bolivar and ran two gas stations. Following his tenure as sheriff, he entered the Missouri House of Representatives and then the Missouri Senate. In his time in the legislature, he fought to strengthen laws protecting farmers, the use of deadly force to ward off attacks, and was an outspoken opponent of abortion. 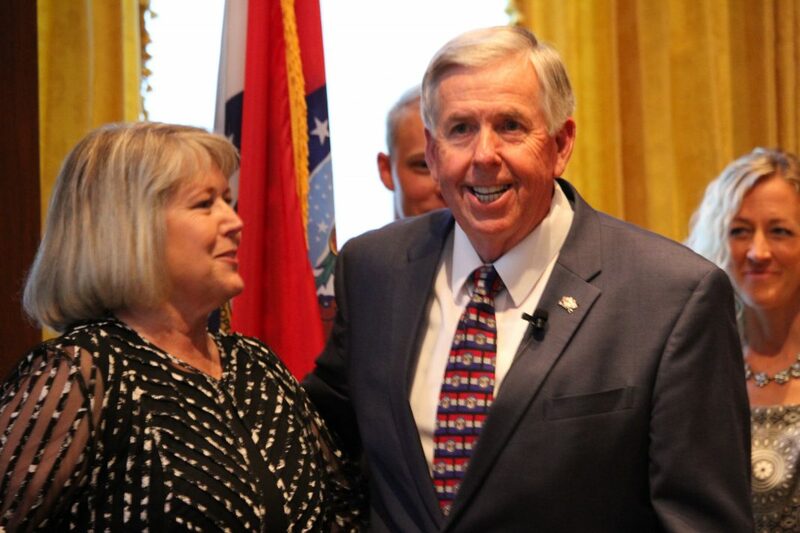 As lieutenant governor, Parson led the effort to overhaul Missouri’s board and commissions and has highlighted problems at veterans homes. He came out in support of raising taxes for transportation infrastructure and was opposed to Greitens’ move to freeze low-income housing tax credits. Many Republicans expect that Parson will bring stability to the Governor’s Office and his legislative experience will help push forward conservative priorities. “As a county official, an effective state legislator, and Lieutenant Governor, he understands our state in ways that few people do. He will be a great governor and I look forward to helping him in any way I can,” said U.S. Senator Roy Blunt. “Mike is a well-respected and qualified leader. I believe he will bring a spirit of openness and collaboration to the office. I look forward to seeing his achievements as Governor,” said former-Senator Kit Bond.